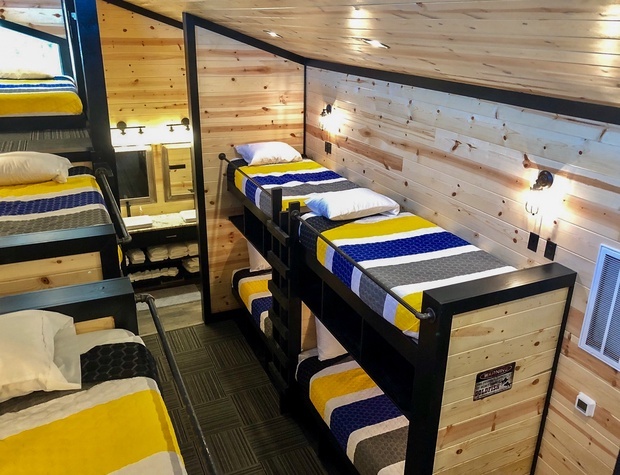 “Off the Hook” is a BRAND NEW 5+ Bedroom LUXURY CABIN that accommodates up to 23 GUEST!! This is a truly exquisite cabin experience, It’s literally “Off the Hook”! With all the modern amenities and style you could dream of!! Located in the gorgeous Pine Hill area of Hochatown, you are minutes away from all the fun and adventure Broken Bow Lake and Beavers Bend State Park have to offer! This is a true family vacation paradise!! Enjoy the amazing view, being surrounded by towering pines and private pond!! The kitchen is a modern masterpiece, featuring sleek black cabinetry, granite counter-tops and stainless steel, you can cook up gorgeous, gourmet meals for all your guests! With an open living and dining area, it makes the perfect environment for entertaining! The elegant lighting and decor as well as stunning views of the outside from the large windows, make for a truly memorable vacation experience! Each of the 5 Master suites has their own private SCREENED in patio! Couples will love this unique feature as well as the private staircases leading to the hot tub, and the GREAT OUTDOORS! If that isn’t relaxing enough, each suite has a spa like retreat in the luxurious tiled showers with rain shower heads and large soaking tub! The kids will also love the space dedicated to them! 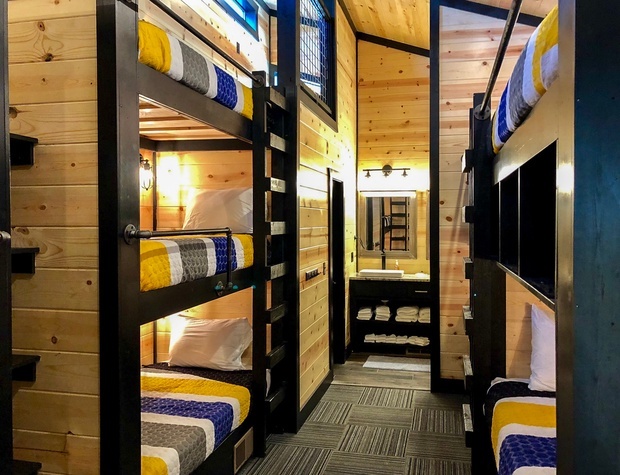 The bunk room houses 13 twin beds, washer/dryer and private bath! 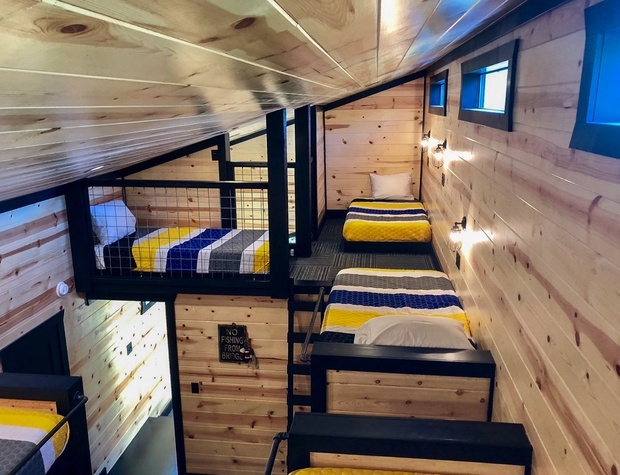 This large “treehouse” bunk space makes an awesome camp space for all the Kids! 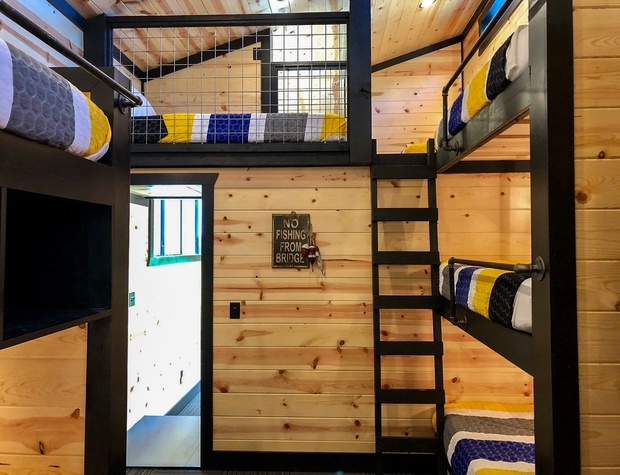 (and adult kids) Right off the bunk Room you will find an awesome playroom with Huge windows overlooking the lost Creek Pond. Don’t forget to check out the Game Room with access to the HUGE screened in patio!This Awesome space has pool table, shuffleboard table and retro video arcade featuring over 60 games and much more to offer all day family fun! The outdoor amenities are just as spectacular! Private screen in porches off each master suite with staircases to the hot tub area, Large screened in porch with a Rock fireplace for the Whole family to enjoy! Enjoy a game of horse shoes, while the Kids run out some energy on the playground fort, or sit around the fire-pit and enjoy the stairs while roasting marshmallows with the people you love! With breathtaking views of the Lost Creek Pond and the towering Pines, you may want to spend all of your time soaking up the sun and listening to the glorious sounds of nature! We also have free WiFi. BBCL is not responsible for speed or reliability of internet service from Pine-net.